One way is to show the users response and the correct answer as two columns. In this case, in the 'response' column, all options are shown and the selected response is highlighted, whereas the others disabled. An 'X' indication shows whether the answer was right or wrong. Another way is to show all the options listed, with the selected option highlighted. And finally, show an icon for the right answer. The main concern, in this case, is that we are not showing whether the user's result is right or wrong. P.S: I have a colour constraint with the texts.Text can't be coloured green/red. But there can be coloured icons or Text shading (black/grey/white). Use radio buttons to indicate the choice, use strikethrough to indicate the wrong answers. Second approach looks simpler to me with a little change. See attached image which provides more clarification. See a sample image from Interaction Design Foundation Quizzes (https://www.interaction-design.org). 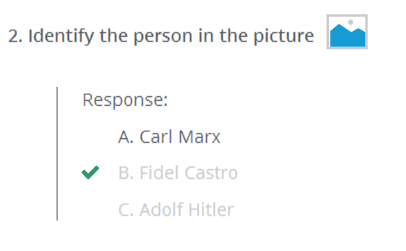 The way they are showing correct and incorrect answers is really user-friendly. Not the answer you're looking for? Browse other questions tagged question-answer questionnaire quiz or ask your own question. How does providing feedback influence quiz performance? Forms: pattern to create/convey dependencies between fields? What would be the best way to display “Content submitted” confirmation message after an user posts a question / answer / comment? What do users expect from a multiple answer question? 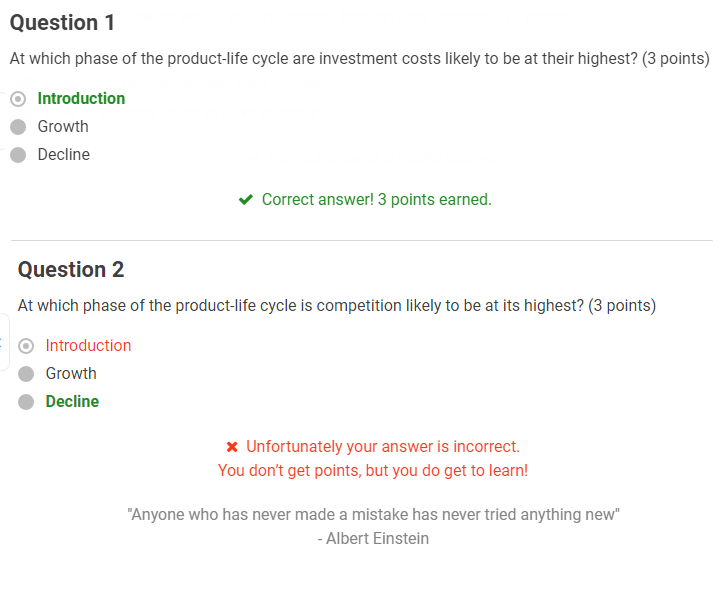 How to display interactive true/false questions for learning? What is the best experience for long mobile questionnaires? What is the best way to ask a user to make a preference tradeoff between two options? What is the best pattern encouraging users to complete a survey of roughly 100 questions, each of which uses the same multiple choice scale? What is the best way to show two questions in a single screen. What is the effect of asking more specific questions first in a survey or questionnaire on the user?